Why start your career with AVID? Because AVID’s exciting, team-oriented culture provides the perfect environment to learn and grow financially. 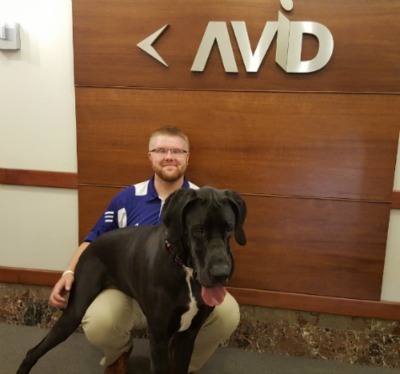 Plenty of companies say they make their offices a great place to work, but AVID can prove it. In a recent survey by an independent research firm, AVID employees reported really enjoying their experience working here. Some of AVID’s workday initiatives that reinforce the positive work environment for our IT Recruiters and Account Managers include constant friendly competitions, bagel breakfasts, casual dress code, dog friendly offices, occasional flexible hours/remote options, summer hours and birthday celebrations. We also have TV’s in every office that stream competition scores and winners, videos, praise for individuals, and more. Outside the workday, AVID commits to playing as hard as it works. Some recent company trips include a day at Foxwoods Casino, a weekend at a Malibu beach house for our West Coast offices, bowling at a local bowling alley, and new hire happy hours at local bars. Another way AVID fosters a great company culture is by ensuring that employees are constantly learning and supporting one another as a team. AVID starts by offering a comprehensive training class for all new IT recruiting hires. After the class, new Technical Recruiters are paired with more experienced ones in a mentoring program. For new Account Managers, AVID provides extensive sales training classes during the workday and continued support from managers and more experienced Account Managers afterwards. AVID doesn’t just set its employees up for success, it also prides itself on its collaborative environment. AVID encourages teamwork with smaller teams, local offices, and even between our offices around the country. To add to that atmosphere of teamwork and support, AVID’s upper management also puts aside time every day to answer questions, provide support, and listen to suggestions for improvement in company policies and procedures. This type of atmosphere makes learning easier and allows employees to gain new skills and insight from a variety of people. This culture has also led to numerous positive reviews and a near perfect score on Glassdoor. Besides learning, working hard, and playing hard at AVID, you’ll also have the opportunity to kick-start your career– both financially and in terms of growth. In addition to providing competitive base salaries and benefits, AVID gives our IT recruiters and Account Managers the chance to increase their income exponentially. If you put in the hard work at AVID, you’ll see the result in your paycheck. AVID has some of the best bonus and commission structures in the industry, and with our team-oriented environment, we support each other in reaching our goals– financial, professional, and personal. AVID also offers employees the opportunity to grow quickly and have a real impact in the company. In addition to moving from recruiting to sales, AVID’s employees also have the opportunity to launch offices in new markets around the country. On top of supporting financial and career growth, AVID supports personal growth. Employees are welcome to work or even transfer to new offices so they can experience other cities around the country. If you’re ready to grow your career, grow personally, and grow financially, AVID will be a great fit for you!